"How to Recover Hidden Files from Virus Infected USB Pendrive/Memory Card"
Some times we have some data in the USB Pendrive but caused by virus problem we are unable to view or use that data and we think that the data has been lost but actually our data is as it is in the USB drive with the hidden form. Here I am telling you the process step by step for solution of this issue. Download File Recover Tool(Any) and Copy it in your Pendrive or Memory Card and Run the Program, it will automatically Recover your Files and Folder. File Recover Tool Download Here. Or You can Read below to know how to do it Manually. Present days that’s a trend that all the people use USB Flash drives like Pendrive, External Hard Disk and Many more. They all have skipped DVD, CD and all optical Disc because it takes time to copy and it cannot be re-used. So USB Pendrives are now with all people. I used to see all over my college, they always hang USB pendrive in their necks. They carry Music, Movies, Data in that. 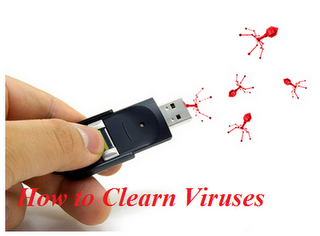 How USB flash drives improves as the mean while USB virus also increases along with that. If you have some nasty virus on USB drive that hide all your file in the drive? ie; hides your files and folders, creates .exe file extensions of your folders and even corrupt your files. But the attributes of these files often stay unchanged even if you uncheck hidden attribute on file/folder properties. Find the drive letter for the connected USB drive. 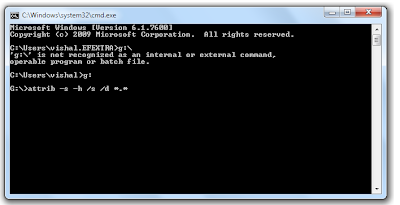 For Example, In command prompt, type G: and Hit enter. Make sure that you put space between each elements in the code. and hit enter and wait for few seconds. attrib -s -h /s /d *. * command makes all the folders including system related folders to appear. 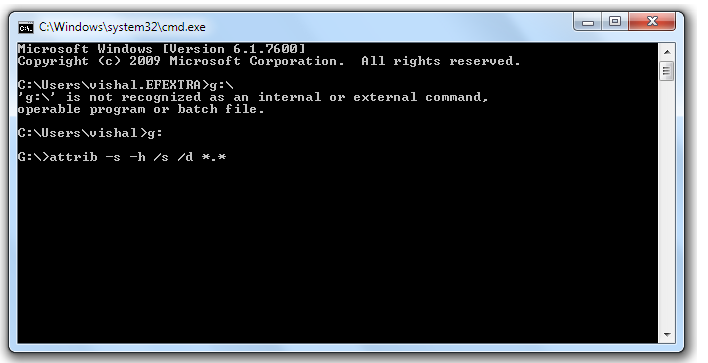 which is bit messy, by using dir/ah command we can easily identify the Virus effected directories easily. This command helps to unhide the hidden folder which are greatly effected by virus in Flash Drives .